Natures Menu Country Hunter frozen raw dog food. 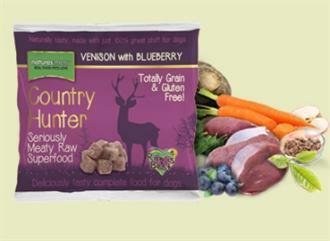 Country Hunter dog foods new range includes a selection of complete and balanced raw frozen nuggets created with no chicken or grain - perfect for the hypo-allergenic dog, truly innovative freeze dried raw dog food a complete and balanced ‘superfood‘ for dogs. Raw Superfood Meal perfect for allergy sensitive dogs. 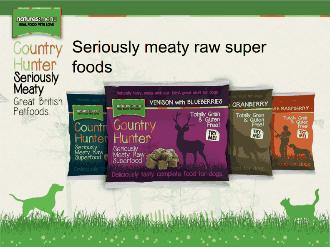 Venison is a nutrient rich, lean meat packed with B Vitamins, high B12 levels and Iron. It is well known for its irresistible rich woody flavours. Blueberries are rich in antioxidants,including vitamin C and vitamin K.
Single protein source, Chicken Free! Composition: Venison (60%), Peas (10%), Swede (10%), Carrots (7%), Apples (5%), Blueberries (4%), Seaweed (1%), Spinach (1%), Yucca Extract, Green Tea Extract, Grape Seed Extract, Yeast Extract, Dicalcium Phosphate, Calcium Carbonate. Analytical Constituents: Protein 13%, Crude Oils & Fats 4%, Crude Ash 4%, Crude Fibres 0.6%, Moisture 70%. Nutritional Additives: Vitamins: Vitamin A 1,000iu, Vitamin D 100iu, Vitamin E 14mg Trace elements: Zinc sulphate monohydrate 50.1mg; Ferrous sulphate monohydrate 20mg; Cupric sulphate pentahydrate 7.2mg, Calcium iodate anhydrous 0.4mg; Selenised yeast inactivated 8.6 mg/kg.